Our white water river trips in the UK happen mainly between October and April, though sometimes we do trips to North Wales in the summer, as well as a trip to the Alps. 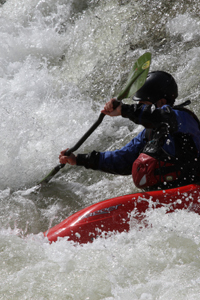 There is at least one white water weekend each month and one day trip during the main season. These weekends cater for paddlers of different ability levels. We mainly paddle rivers from grade 2 to 4 around Dartmoor, North and South Wales (River Dart – West, Upper, Loop and Lower, Lower Tavey, Usk, Tawe, Tryweryn, Upper Wye) though we also do trips to Scotland, Lake District and Yorkshire. We also join in with club multi-activity trips where they are held in white water river areas.